Buy garage door spares, garage door parts, online. A Huge Selection of Garage Door Spares and Parts to buy online from a Company that are Highly Qualified and Experienced in Repairs, with a Helpful Customer Service to Match. Highly Qualified and Experienced in Repairs, with a Helpful Customer Service to Match. We offer High Quality Parts with Low Prices and Fast Delivery, as well as providing you with Fitting Instructions for changing cones and cables, how to add tension to the main spring as well as many more useful guides. 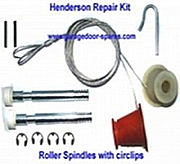 Are you looking to repair the broken cables on your Henderson Garage Door? ask Richard if you require any help choosing the correct parts! The easy way to stop leaves, rubbish and water getting into your garage! Also helps to insulate and stop the cold wind blowing under your garage door! Offering over a decade's experience and advice - here at Garage Door Spares, we will provide the precise part needed to meet the manufacturers specifications and the tools to make repairing your garage door a breeze! A properly installed and maintained garage door can provide security and peace of mind for your vehicle (if you use your garage that way) or general storage (if you don't) for years. Garage doors are firm and well built and there should be no need to replace them if they are looked after. all garage door problems that can only come from years of experience. Take a look around our site - you are bound to find the right replacement part or tool for your need. We stock for all the brands - whether major or more specialist: Garador, Birtley and Gliderol all share space in our stockroom. right replacement item for you to make your repair. From Henderson to Hormann, or Cardale to Compton, we have the cables, door handles and seals to fit every garage door manufacturer - and we stock a lot more than just your basic kit. With a dedication to garage door spares, we focus on the precise part to replace any damaged piece. Look for a seal specific to Westland, or cable to fit a King-made door? We have the exact item. Not only that - but we always have the right tool for the job. There's no point in getting a precision-made replacement part only to try to jimmy it into place with whatever you have lying around. Investing in the proper implement to perform your repair may cost a few extra pounds, but it'll save hours of frustration on the day! industry can seem daunting for a first-time repairer. Our advice is clear and easy to follow. We don't try to confuse with technical terms - it's important to us that you can get the job done and have your garage back to its full secure state. And, if you ever need that extra bit of help, we're available to answer your questions and will do our best to get back to you in a timely fashion. Whatever damage has been done to your garage door, we're here to help you get it back on its hinges - if you need any help, just give us a call, leave a voicemail or write a quick email. Are you stuck on selecting the right parts? Please send a photo to me and I will make sure you get the right parts! New! 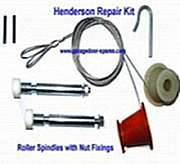 Our own range of Garage Door Repair Kits to fit most garage doors in the UK, these kits include cones, cables and roller spindles! These kits have been put together by myself to help save our customers money as an alternative to buying all of the parts separately. this expertise will ensure that you get the right part for your garage door repairs. your garage door will be as good as new to operate! North and West Yorkshire over the years. We know that it is almost impossible to make your door work with your new parts if you dont have the right tools for the job! that will give you hints and tips that I have picked up over the years to make your job easier for you! Buy with ConfidenceGarage Door Spares from the Experts who Know!